The Cloud Connector is a small component in the SAP universe but it’s crucial when it comes to connect the on-premise world with the cloud world. Many blogs and resources have been already shared in the last years and many questions have been answered. 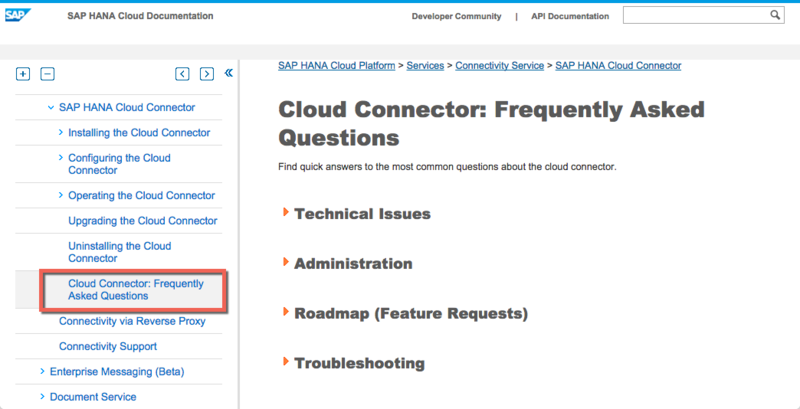 Now we see the same questions about the installation, configuration and operation of the Cloud Connector coming again and again in the SAP community forum. That’s why we have collected them and structured them to make it easier for new users to get started with the Cloud Connector. You can find now a new section in the official documentation called “Cloud Connector: Frequently Asked Questions“. Of course it’s just the beginning and we will include more in the future. Good stuff Matthieu, very useful. Happy to ear that it’s useful. Just read the FAQ, but still have a question. How to configure a HANA XS application to connect to on-premises NW gateway via the SAP Cloud Connector. You can find more info about using destinations for XS apps here. If some company has a security guideline specifying that only centrally administrated cloud connectors are allowed to expose data from the internal network to the internet, and they wish to block individuals from connecting their local SCC to specific SAP backend systems. What is the best way – as an SAP backend administrator – to limit/control which cloud connectors access the backend system? first of all, thank you for your feedback, we appreciate and planning to update it. for now, I’ll try to give an answer here. The “naive guy”, who isn’t aware of the security guideline, reads online about the Cloud Connector and wants to deploy it. An actual “bad guy”, who tries to steal data from the company. Both of them have access to the companies SAP backend system via HTTP or HTTPS (as they’re employed by the company). Perhaps the fastest way is, to block any domain that contains “connectivitycertsigning” from DNS resolving. This will prevent the Cloud Connector from being able to connect to the Cloud (but not to the Backend System). Keep in mind, for a malicious attacker with a reasonable technical background this is not much of a problem. Also, this is something only a network administrator can do and not the “SAP backend administrator” as you requested. Blocking based on user-agent would be possible, you could block any user-agent that starts with “Apache-HttpClient”. This should work but is not documented, so the user-agent used by the Cloud Connector could change at any time. The methods you provide are good ideas. I was hoping there was a flag or parameter that could be used.. First method would stop all SCC communication, not only the “bad” ones, right? Second method seems better, but as you say – undocumented and sort of a hack. Anyway, I would like to test it out. Do you know if HTTP header data like the user agent can be filtered in SMICM? First method would stop all SCC communication, not only the “bad” ones, right? I’m not a network administrator, but I’m pretty sure this should be possible (even my home router supports this). Second method seems better, but as you say – undocumented and sort of a hack. Anyway, I would like to test it out. Do you know if HTTP header data like the user agent can be filtered in SMICM? In this example 10.0.0.123 is the IP address of the “good” Cloud Connector. I don’t know if there is any better way to achieve this, sorry. If you try it, let me know the result.